Rio de Janeiro — people from across the world have gathered to attend the 2016 Summer Olympic Games. Now it is the second largest city in Brazil. But 229 years ago, in 1787, it was the country’s capital, and a major port. Why is that year significant? On August 6, 1787, the visitors who arrived in Rio could not have been more different from today’s Olympic athletes. In fact, they were prisoners…convicts in the “First Fleet” from Britain on their way to establish a penal colony at Botany Bay, Australia. Eleven 3-masted ships were the first in a program called “transportation” that continued until 1868, delivering about 165,000 convicts to Australia. The fleet entered Rio’s harbor through a narrow entrance guarded by forts. Its commander, Governor Arthur Phillip, bought fresh provisions for his ships, and took aboard seeds that would grow in Australia: coffee, cotton, indigo (the tropical plant produced a much desired blue dye). After a month in Rio, the fleet continued on its way eventually reaching its destination on January 20, 1788. 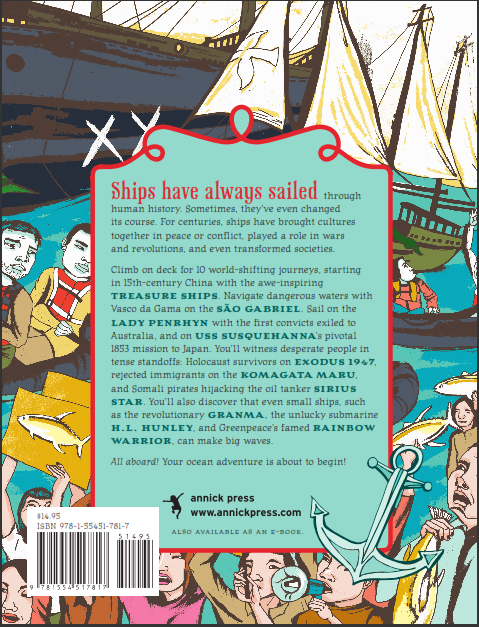 Find out more about the voyage of the First Fleet—in particular the ship Lady Penrhyn—in my book 10 Ships That Rocked the World (Annick Press, 2015). It is part of the series, World of Tens. 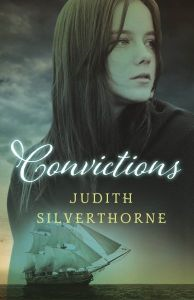 A colleague, Judith Silverthorne, has also written about the transportation of convicts in a YA novel, Convictions (Coteau, 2016). The story follows 14-year-old Jennie, sentenced to 7 years in Australia for stealing a sack of oats to help feed her starving family. Loaded with tension through dramatic action scenes, this well-researched book will give you an authentic taste of life aboard an 18th-century convict ship. Today in Ottawa, Prime Minister Justin Trudeau formally apologized for the role the Canadian government played 102 years ago in refusing entry into Canada to 376 passengers, all nonwhite British subjects, aboard the Komagata Maru. The incident revealed injustice and discrimination in Canadian immigration laws and led to eventual change, but not before the mid-1900s. In 2008, the province of BC made a formal apology, and Prime Minister Steven Harper apologized to the Sikh community at a local festival. Here it is! My new book will be out in late summer. It will add one more title to the World of Tens series from Annick Press. This front cover image by Kim Rosen is from Chapter 5, about H.L. Hunley, the first submarine used in battle during the US Civil War. But it didn’t attack this ship — the Lusitania was torpedoed by German U-boats in 1915. One hundred years ago! Submarines had come a long way since 1864, and they’ve continued to evolve. Here’s the back cover blurb. Now you can see the whole list of 10 ships. Hope you will be curious to read the stories about them later this year. Did you guess the name of the submarine in my last post? The H.L. Hunley was significant in the development of the modern submarine. In my book, 10 Ships That Rocked the World, coming out later this year, you can read about the Hunley’s exploits during the US Civil War. After its one and only attack on an enemy ship, it sank. It was raised from the sea bottom near Charleston, South Carolina after 136 years. Now it is being studied by archaeologists at Clemson University in Charleston. Another ship in my book, the 3-masted wooden cargo vessel, Lady Penrhyn, was one of the First Fleet that transported convicts from Britain to Australia in 1788. 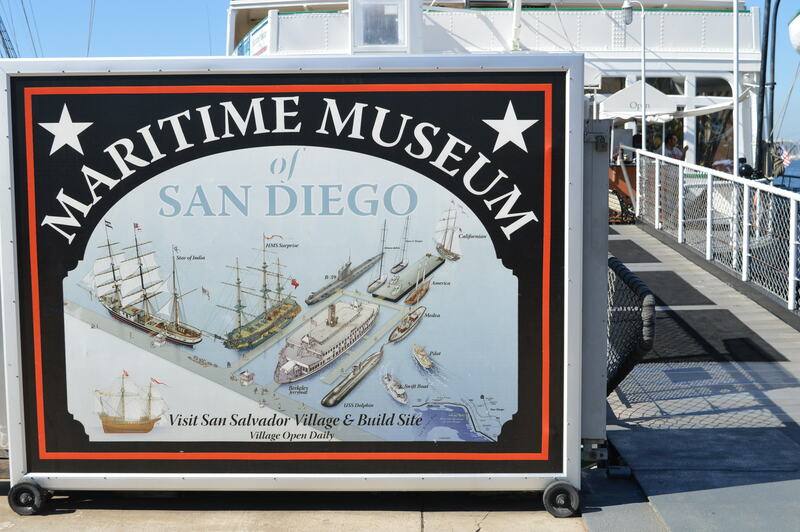 Steamships eventually replaced sailing ships for moving cargo, but if you want to see large sailing ships, you can visit a maritime museum on the east or west coast of Canada or the US. Or watch for a festival of tall ships, held every year to offer visitors a chance to learn about the Age of Sail. 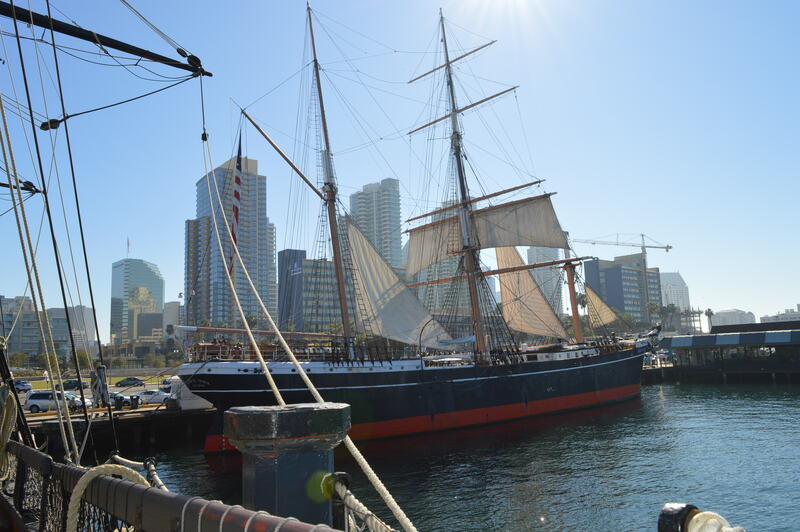 In San Diego, the Maritime Museum displays the Star of India, a 3-masted ship too, built of iron in 1863. Its tonnage (the weight of water displaced) is about 3 times more than the Lady Penrhyn, it’s about twice as long at 62.5 metres and a third as wide with a 10.7 metre beam. 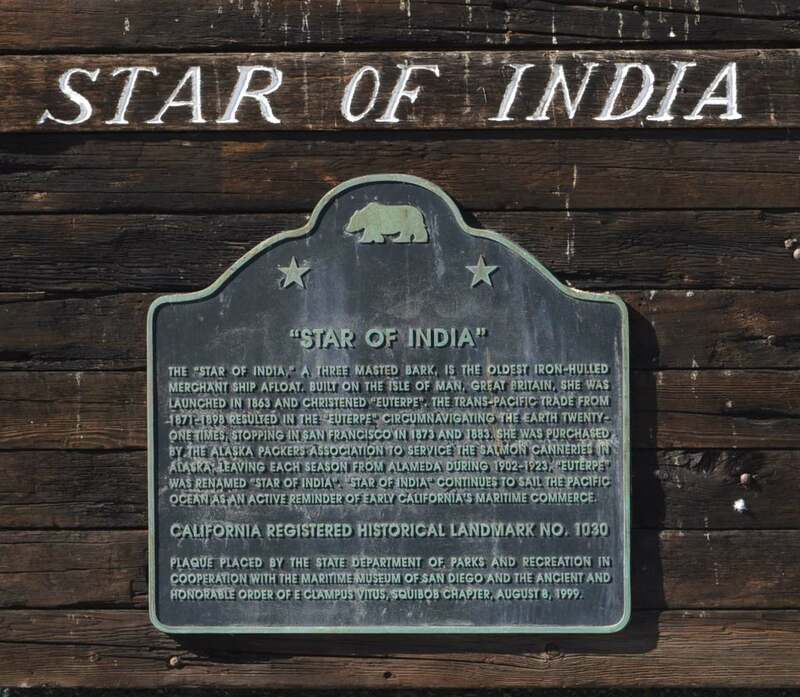 I walked the decks of the Star of India, trying to imagine what it must have been like aboard the much smaller Lady Penrhyn for 104 convicts on an 8 month voyage from Britain to Australia. 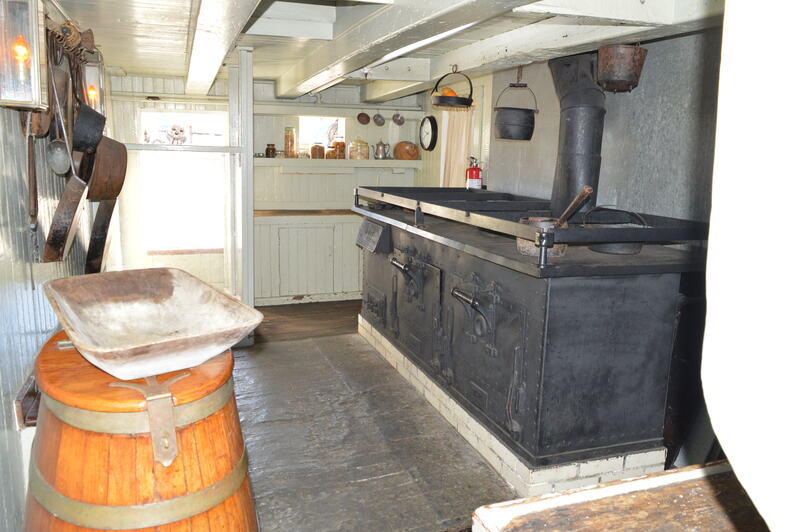 The galley, such a small space to prepare food for so many. 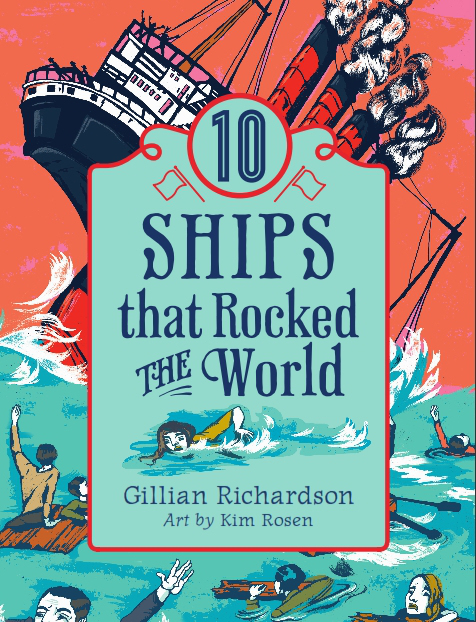 My new book, 10 Ships That Rocked the World, is in the design stage at Annick Press. It’s always exciting to see the layout of the text I’ve written together with the illustrative material – in this case, some great photographs — chosen by the publisher along with illustrations by Kim Rosen, who worked on other books in this series (World of Tens). After many months of work, it’s finally looking like a book! No cover image available yet. A guessing game! Instead of telling you which 10 ships are included, I’ll plant some clues in upcoming blogs to help you try to figure them out. 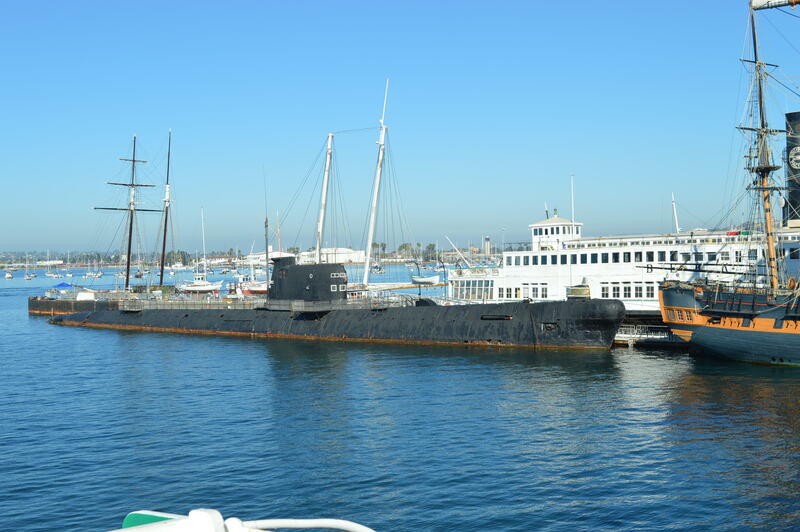 So…….I toured the Maritime Museum in San Diego recently, and two of the exhibits were submarines. The Dolphin is a 1968 US sub that achieved several ‘firsts’: an operating depth record, the deepest launch of a torpedo and the first undersea email transmissions. 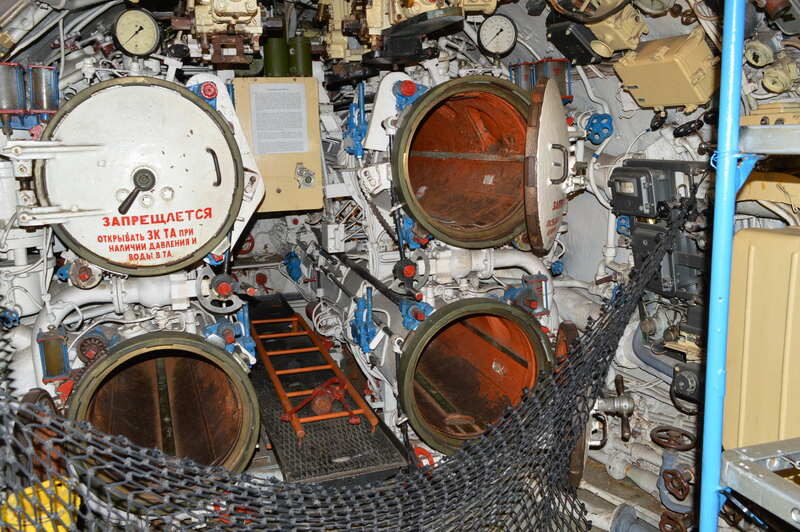 B-39 is a Cold War era Soviet sub. 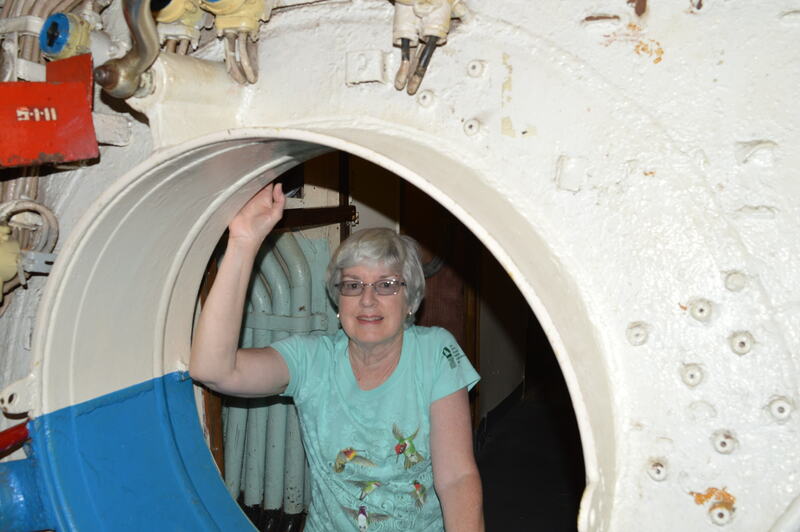 It was hard to imagine how a crew of 78 was able to work within its tight space. The ‘submarine’ in my book was the great-great grandfather of both these vessels. It is remembered for a tragic ‘first’, but is mainly important for inspiring this new class of ship. Any guesses? Sure glad the doors in my house aren’t round. I’m working on a new children’s book about ships…exact title yet to be decided. It will be part of a series that began with 10 Plants That Shook the World (Annick 2013), and I hope to see it released in late summer 2015. For now, you’ll have to guess which ships will be included. Keep in mind that the 10 plants in my first book had a lasting impact on the world. The stories about ships will inform and entertain you in a similar way, with each ship drawing attention to a significant historical event. One detail included in the book will be ‘Where is it now?’, showing the eventual fate of the ship. That got me thinking of shipwrecks. Divers visit many worldwide, but I’ve been able to visit this one without getting my feet wet. 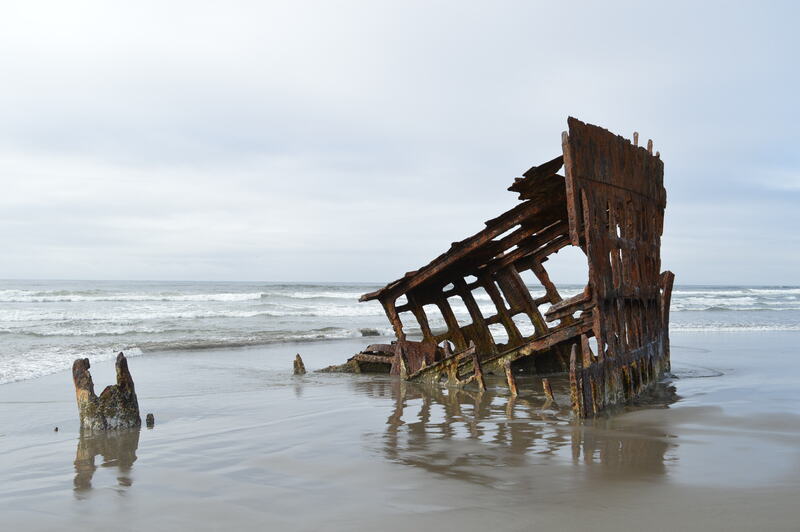 In 1906, the Peter Iredale, an empty cargo vessel was enroute from Mexico to Portland, Oregon. Caught in a southwest gale just south of the Columbia River, it ran aground. Masts and rigging smashed onto the deck and while the ship was a total loss, all hands survived. A salvage company from Astoria removed all but the forward section of the hull. That’s the popular landmark you now see on the beach in Fort Stevens State Park. If the Peter Iredale had reached the Columbia River, it would have faced the dangerous Columbia Bar. This stretch of shifting sand has claimed thousands of vessels through the years. Even with dredging, the channel remains narrow and river pilots guide ships through it. 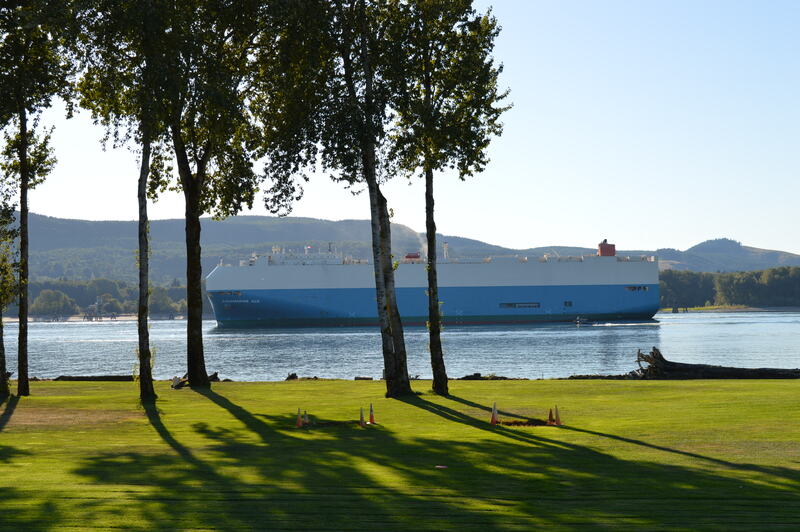 Today, ocean-going freighters, like this Vehicles Carrier, can sail upriver to Portland, OR and Vancouver, WA, and barges right up to Lewiston, ID. By the way, neither of these ships will be in the book! Keep guessing!